Home » Game Restoration » T-5 weeks and counting! 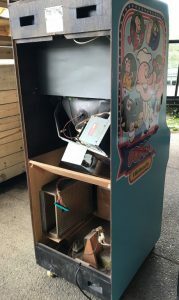 Cabinet(s) – Nintendo VS. Unisystem cabinet with some Popeye donated/reference internals. Japan made, so plywood to match the original prototype Sky Skipper cabinets. Cabinet has a fair amount of nicks, cuts, scrapes and a few pretty deep gouges along with needing some corners repaired. It is probably hard to tell it from the picture, but the Unisystem cabinet is actually fairly rough. I need this baby to be completely pristine, so it is undergoing a total transformation… more on that process and the end result to follow in the build log (link forthcoming). Monitor is dim, has burn and could really use a cap kit. 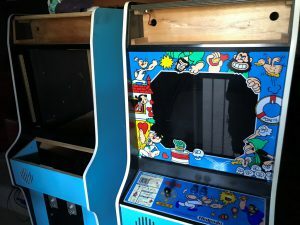 I’m planning on swapping in a burn-free Sanyo 20-EZ (Popeye) in place of the current monitor. I don’t feel so bad using a Vs. upright, as it is a perfect donor and it wasn’t leading much of a distinguished life to this point. Fortunately, I do have a really-nice red tent, so it doesn’t feel like a huge loss to phoenix a ‘faceless’ Unisystem for Sky Skipper. Much of the Vs. wiring (and the power supply) are of no use for Sky Skipper, so I have to turn to my Popeye for help there. This is a case where I’m literally having to combine bits of both games into one final game. Fortunately, I have some spare Popeye harnesses I can use so it’s not a total rip/replace job. I’ll find enough pieces and parts later on to put Popeye back together, but for now, both it and the Unisystem are taking one for the team. 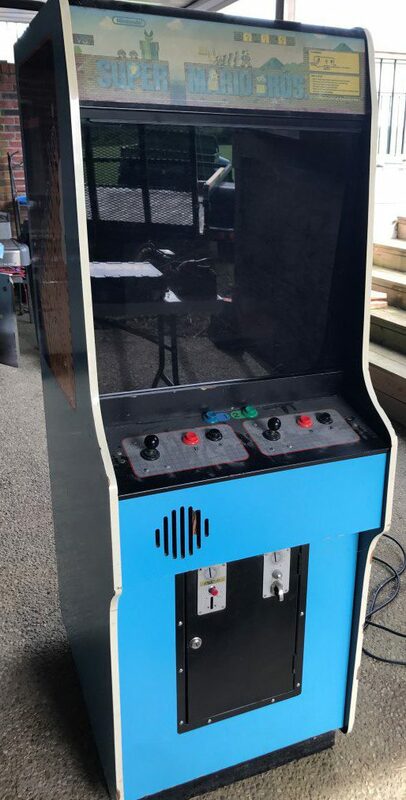 The control panel harness has to be wired up to accept the additional button and I’m still researching the proper joystick to use for the game. More to follow in a T-4 update next week!